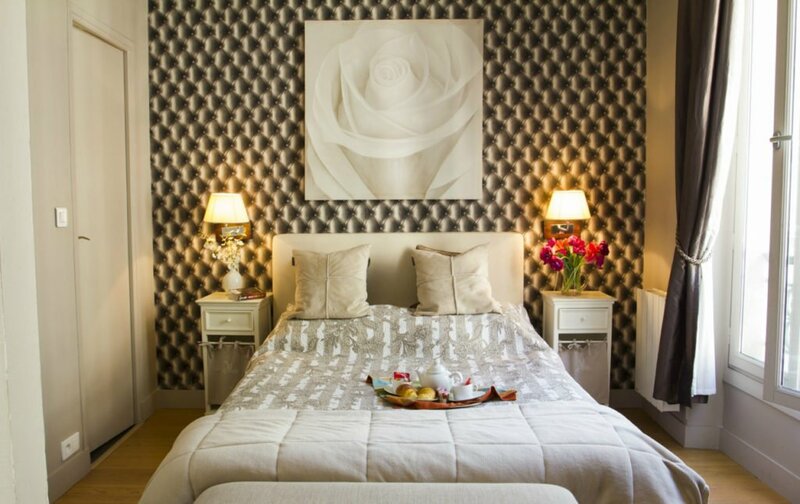 We love finding the perfect Paris apartments – of all sizes! 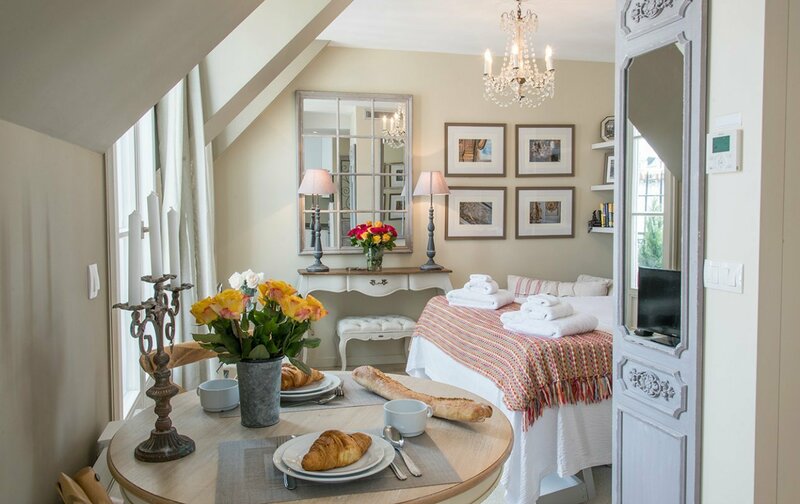 We know some travelers are in search of large apartments with room for the whole family, while others are dreaming of a cute and affordable pied-à-terre for a romantic or solo trip to Paris. 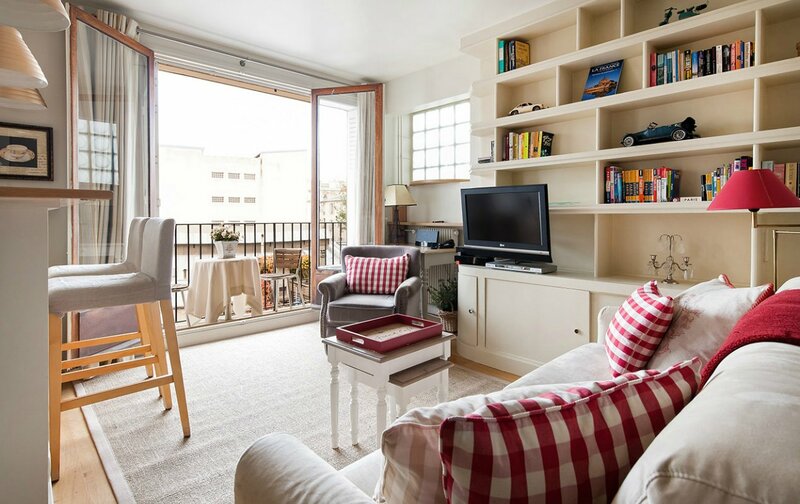 Our cute and cozy Parisian style studios offer the same standard of excellence, just with a smaller footprint, and are some of our most popular apartments in Paris! 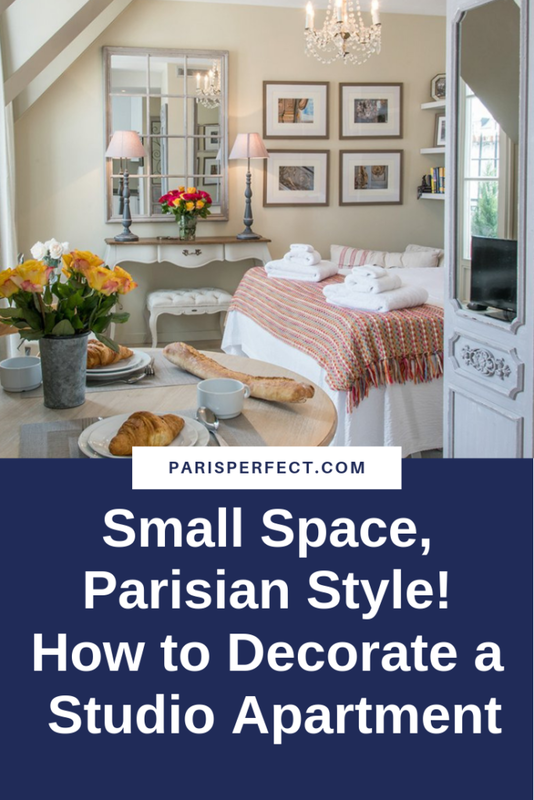 Remodeling Paris apartments is our passion, and we are no stranger to making the most of the square footage we’re given. And we’re firm believers that just because it’s smaller doesn’t mean it has to look like a college dorm room. 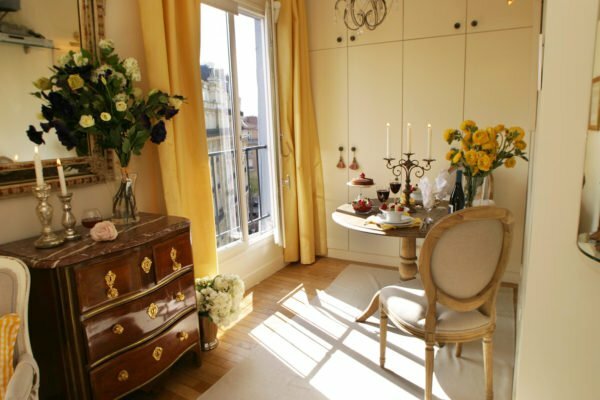 Here are some of our best tips to make even the tiniest space look Parisian chic! Mirrors, light colors, large windows and/or lots of great lamps will work miracles at making a space feel bigger. 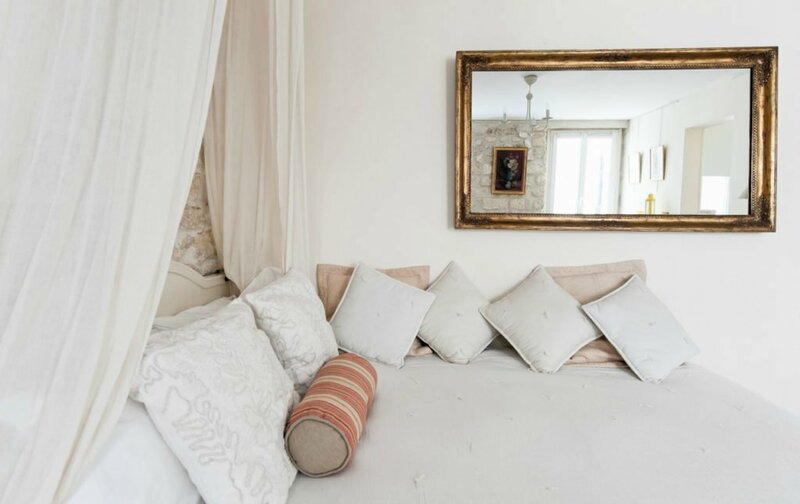 The space is drenched in bright neutrals, and the mirror is perfectly placed opposite the window to reflect all that uplifting sunlight. It immediately makes the space feel bright and spacious! Not only do round or oval tables take up less space, they also prevent any unfortunate accidents for all the clumsy people out there (we know we aren’t the only one!) because there aren’t any sharp corners to bump your hip on! Round tables can also offer more flexibility than square tables, since you don’t have to worry about corners getting in the way of extra chairs. 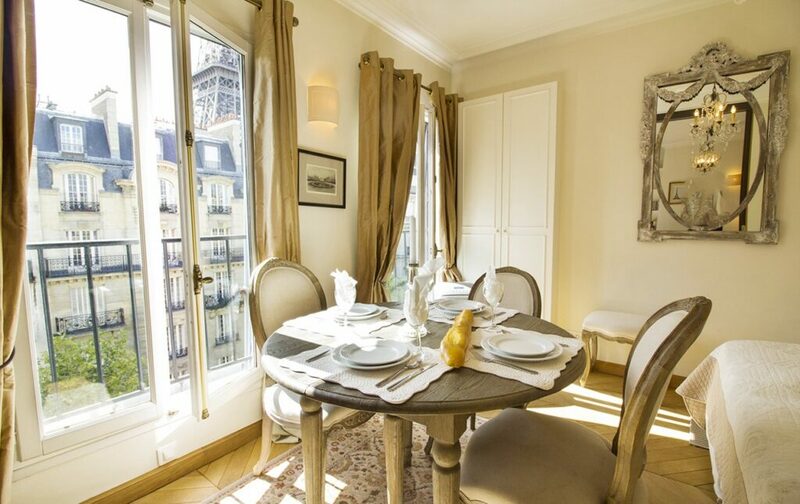 The dining table in our cute Saumur studio apartment overlooking rue Cler is the perfect example! Setting up symmetrical vignettes not only looks nice, but contributes to the overall feeling of tidiness in a space, and when things are tidy, they look bigger. The worst thing you can do to a studio is overload it with too much stuff. You want things to be clean and open. One of the best ways to implement symmetry is with the bed and nightstands, as you can see in our stylish Cerons studio apartment above. 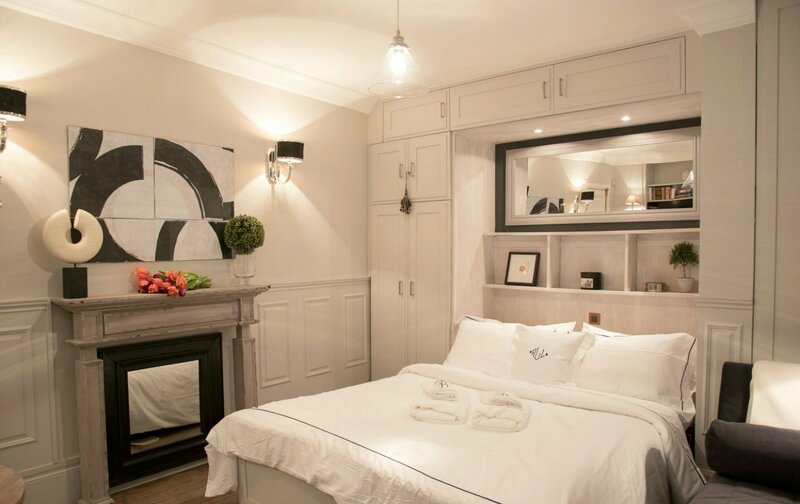 One of the biggest challenges for studio apartments is finding proper storage space, especially in historic Paris buildings where closets aren’t the norm. That’s why we love adding built-ins. If you cover an entire wall with white storage, it doesn’t look disruptive or cluttered like a stand-alone armoire would. Instead, all the things you need to store are nicely hidden away and the entire unit recedes into the wall, just as you can see in our Picardin studio apartment above. Most furniture is made with a full-sized home in mind. The scale can often be way too large for a studio space. Keep an eye out for companies who offer small-scale furniture – petit armchairs and small sofas. You don’t have to sacrifice style for smaller sizes. Also opt for small coffee tables that can easily be moved around to create more space. We’re sure you’ve seen tons of clever space-saving tricks all over the internet, and that’s because they work wonders in small spaces! What looks like a wall cabinet is actually a pull-down bed! All you have to move is the little coffee table and a few cushions to transition into bed-time. We used this ingenious design in our Saumur apartment to take advantage of the space and sunlight. There are so many other space-saving hacks you can use, including loft beds, horizontal pull-down beds on sliders, ottomans that double as a storage container, building hidden storage compartments into stairs … and the list goes on! But we hope that you’ve gained some great petite Parisian style inspiration from this post. Feel free to share your own décor projects over on our Facebook page! We’d love to see! NEXT: The Best of Rue Saint Dominique – The Hottest Street in the 7th! Posted on Wednesday, February 15th, 2017 at 7:04 pm in Parisian Home Decor. You can follow any responses to this entry through the RSS 2.0 feed. You can leave a response, or trackback from your own site. 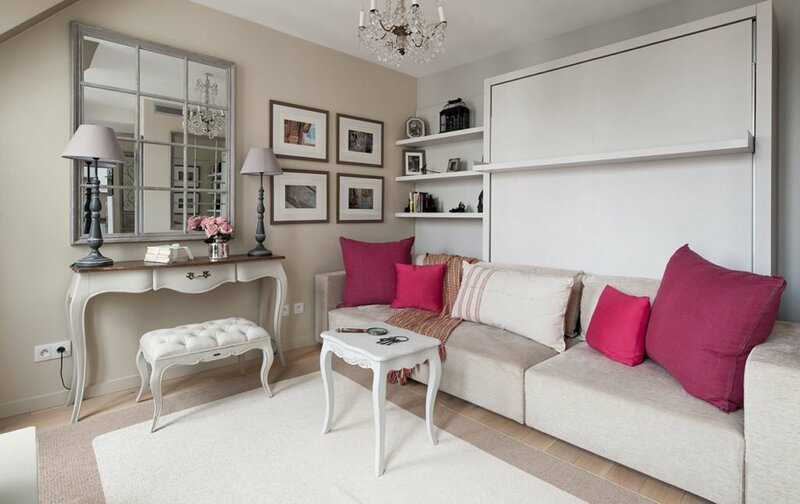 Transform Your Home Into a Bohemian Parisian Escape Our Kir Apartment Rental in Paris, a New Look! 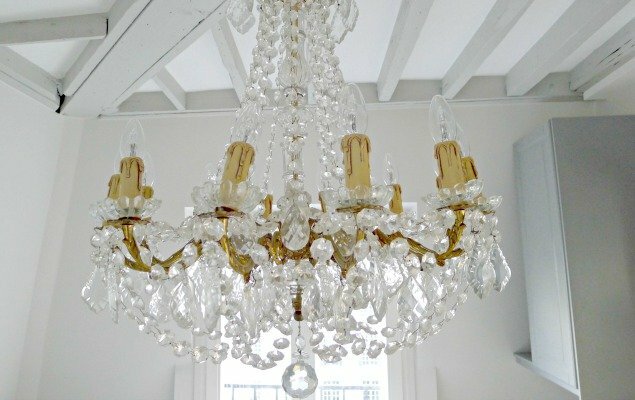 Dramatic Décor Transformation in the Bandol Apartment! Can This Apartment Be Salvaged? – An Update!